Another says, "same group, second bird from the right." You can almost hear the birders thinking, checking the fieldmarks, and someone calls out, "pectoral." Another says, "The one facing us? Preening now?" Another says, "semipalmated and least in the back." All birders are talking into their scopes, eyes trained to the eyepiece and ears listening to birds and each other. You cannot overestimate the learning and bonding that goes on in the scope line. And, for years, I could not participate in that very special experience because I use a manual wheelchair. For years my fellow birders tried to help me get scope views. 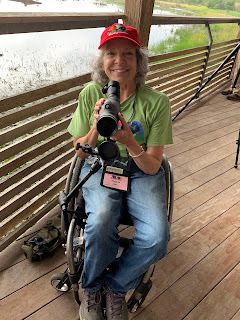 They lowered their scopes, situated the tripod around my wheels so I could get my eye to the eyepiece, patiently instructed me on focusing the scope. Valient efforts all and sometimes successful, but always frustrating. I wanted to be in charge of my own scope and be an independent and full fledged part of the scope line. I awoke the next morning to a text from Judith picturing a window mount for a scope. It was time. I borrowed her lightweight Nikon scope and headed to Precision Camera on a mission. I rolled in the door and headed toward the information desk. I held up the scope and said, "I need to find a way to get this scope attached to my wheelchair." The employee said, "I have just the guy for you." He escorted me to a counter where he introduced me to Robert Bachman and Ethan Strong. 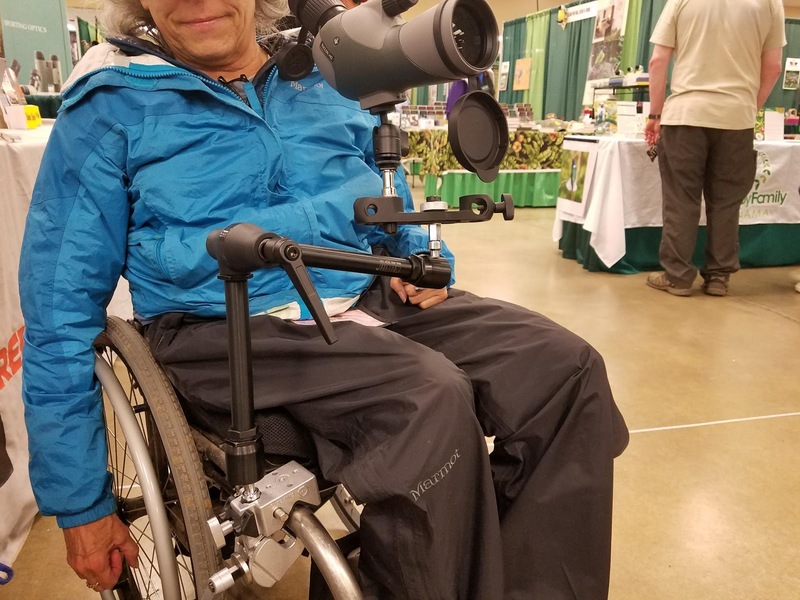 I held up the scope and said, "I need to find a way to attach this scope to my wheelchair." Robert said, "I have just the thing" and set off across the store. I wheeled behind him trying to keep up. We arrived at a shelf where he grabbed a package, opened it, and pulled out what looked like two metal sections connected in the middle with a toothed gear. It looked rather like an arm, the gear in the middle like an elbow. He showed me how the device worked and then said, "Okay, next C-clamp," and off he went. The whole time he was putting this attachment together, he was saying, "I know exactly how to do this." He attached the C-clamp to the arm, and then set off to another part of the store, saying, "Now a mount." I followed in close pursuit. He attached the mount. By now we had attracted a couple other curious employees. As we attached the scope, I said. "Wait, the scope has to move up and down and right and left," and one of the employees said, "Baby ball bearing!" and off he went. Once baby ball bearing was attached, scope was attached, and the eyepiece was immediately positioned below my right eye, and...and...and...I could SEE!!! Everyone clapped! Oh Happy Day! I almost cried with joy. I could put the scope on and take it off myself, each piece lightweight enough for me to manage independently. And, I could even wheel easily with the scope in place. The entire event at Precision Camera had taken fifteen minutes. Needless to say, I was thrilled. Next step, purchase my own scope. Another Hornsby early evening, same warm, smelly breeze, another beautiful western plateau of blushing clouds. As the birders piled out of their cars and set up their scopes, I excitedly put my scope together, went down my ramp and wheeled to a place on the scope line, listening eagerly to the conversation already underway and getting on the bird with everyone else at the same time. I looked up joyfully from my scope and said, "Guys! I'm part of the scope line!" Everyone smiled and said, "Yes you are." Thanks for sharing this! 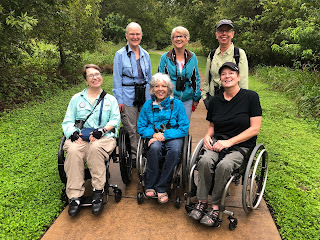 We are working hard at Madison Audubon (WI) on making our birding events and our sanctuaries accessible for all abilities, and this post on having a wheelchair-mounted scope is so helpful. Thank you! Can you share how much this set up (without the scope) costed? 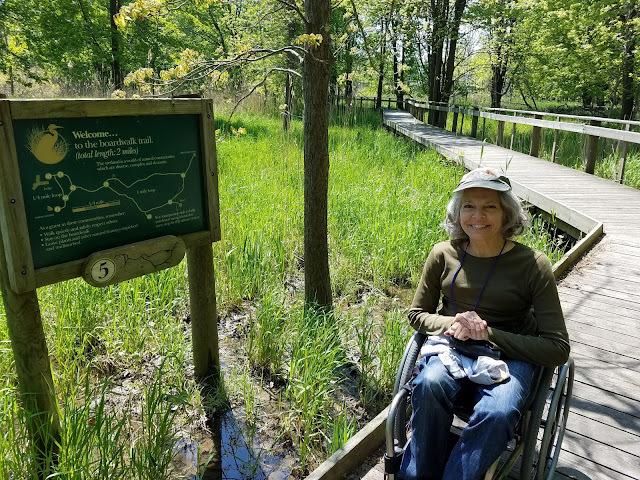 Is it transferrable between wheelchairs (i.e., could our organization buy a set up like this and mount it to whichever wheelchair user (s) is/are at our event)?